After filtering, the water goes into a tank measuring about 16 inches by 11 inches that holds 3.2 gallons of water. The faucet is chrome-finished, and the filters should be changed every six months or 365 gallons. The system is relatively easy to install. However, keep in mind that if you rent, chances are you won’t be able to use the system; you have to be able to drill into the water pipes to install the Aquasana and there also needs to be a hole in your sink countertop for the hardware to pass through. You can eliminate any chance of leaks or incorrect installation by having a plumber put the system together for you. Also, make sure that the filter is not installed on the same drain pipe as your garbage disposal if at all possible because the drain line may get clogged up and cause water to leak from the top of the faucet. By all accounts, the system does exactly what it’s supposed to. 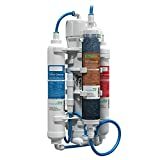 The Aquasana OptimaH2O is advertised as being able to remove 95 percent of fluoride and mercury, 97 percent of arsenic and chlorine, and 99 percent of asbestos and lead particles. One purchaser actually had the water tested, and it brought down the solid parts from 400 per mil to 100 per mil. The system is also NSF certified, which means all parts are certified—not just tubes or tanks. Founded in 1944, NSF sets requirements on how the system not only cleans the water, but how it reacts to 15 different household contaminants. The OptimaH2O also comes with a two-year warranty and toll-free lifetime customer service support. This system uses a lot of water to produce one gallon of clean, purified water. In fact, the efficiency rating is 17.91 percent, which means that for every gallon the system produces it uses 5.6 gallons. If water is a scarce commodity, this system may not be for you. Another problem is that water pressure is poor, and it takes over an hour to produce a gallon of water. The company states the flow rate is 0.8 gallons per minute, but in reality it is much less than that. The Aquasana AQ-RO-3.55 OptimH2O does do what the company promises it would do, which is to clean your water of minerals and put some back. Unfortunately, the system runs incredibly slow. The filters aren’t cheap either, coming in at around $60 apiece. 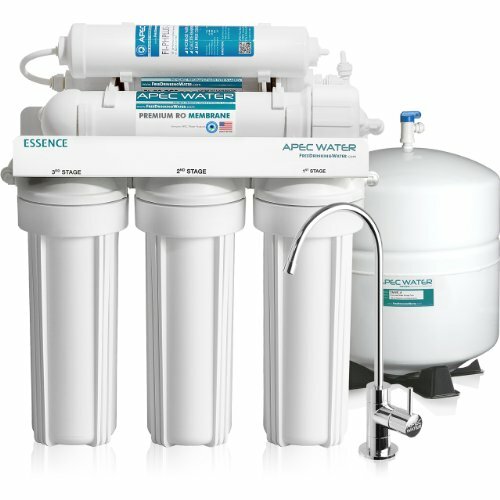 If you’re willing to wait for your purified water, the Aquasana is an excellent choice. 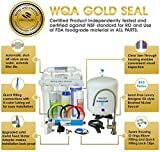 If you have multiple people in the household wanting water quickly and easily, this is probably not the system for you.